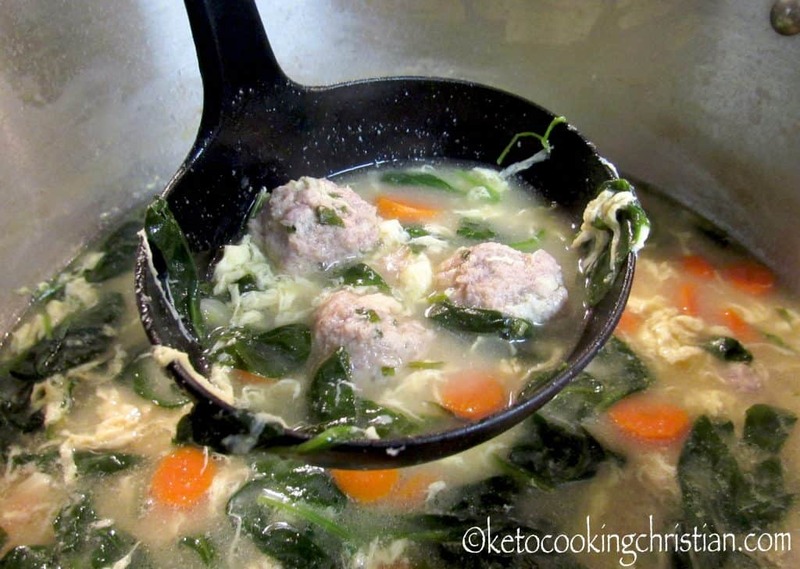 Tiny tasty meatballs in a chicken broth with spinach and egg drop makes this soup hearty and delicious! 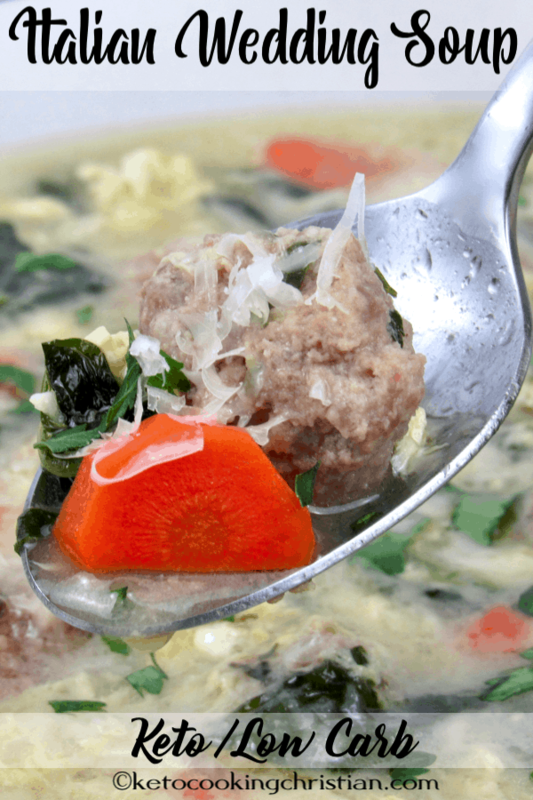 This is one of my all time favorite soups! If you’ve never had it before, you are in for a treat! 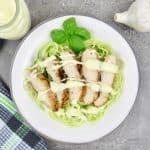 It’s incredibly easy to make and even the pickiest of eaters will love it! 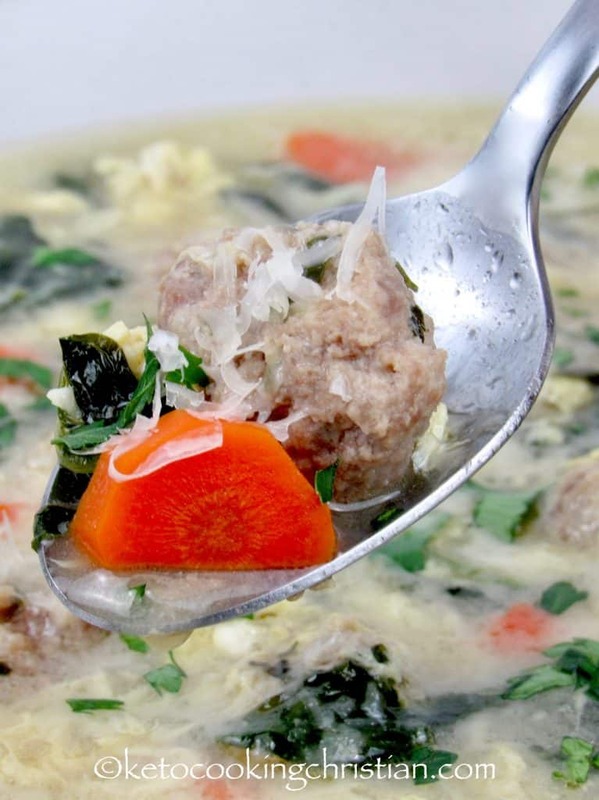 Italian Wedding Soup doesn’t get it’s name because it’s served at Italian weddings. It actually refers to how well the flavors marry together. The base for the soups is chicken stock, which I love to make from scratch in my Instant Pot. It only takes 1 hour pressure cooked, but tastes like it’s been simmering for 4-5 hours! 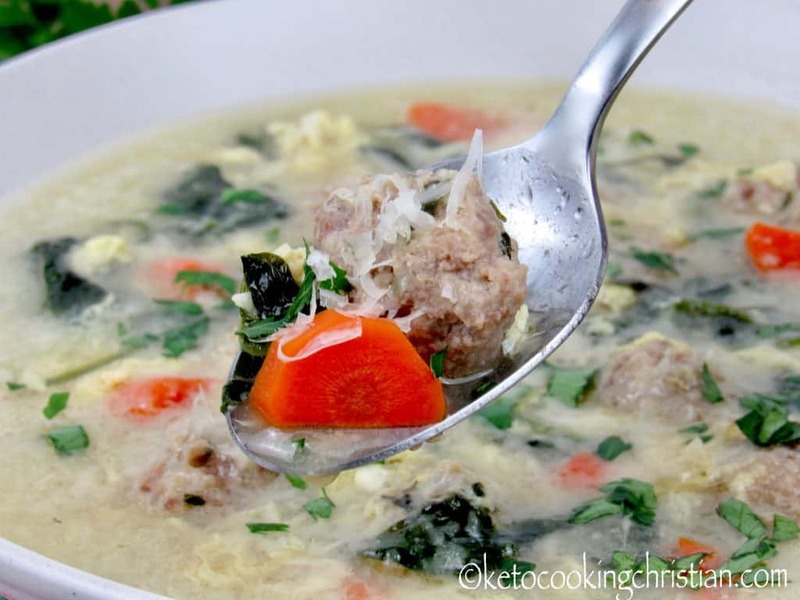 I add mini meatballs, cauliflower rice, parmesan cheese, fresh spinach and a swirl of eggs, similar to making egg drop soup! This soup is so hearty and is perfect to warm you up on cold days! 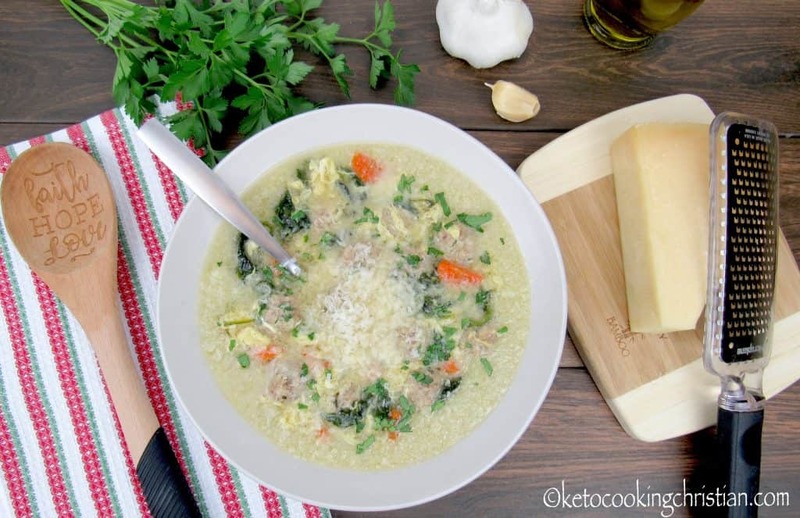 I add a parmesan cheese rind in this soup, which is optional, but highly recommended! 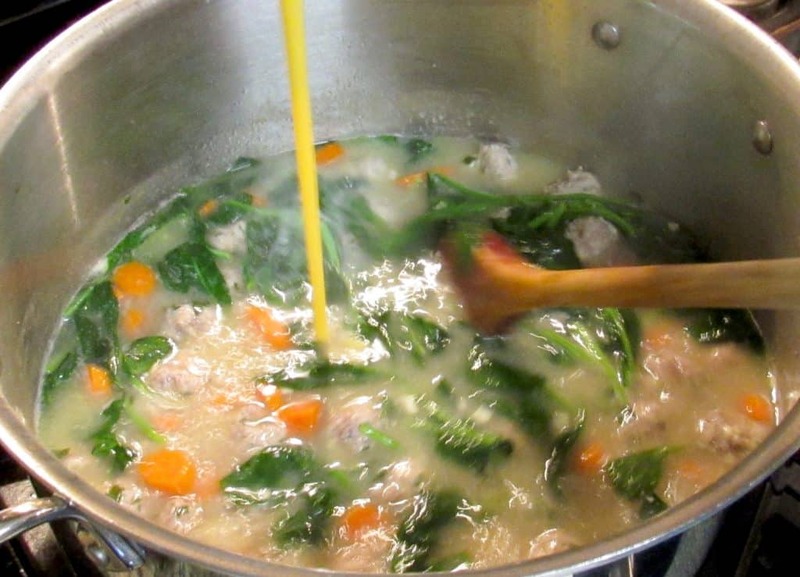 It gives the soup a huge boost of flavor and also helps to thicken it slightly. 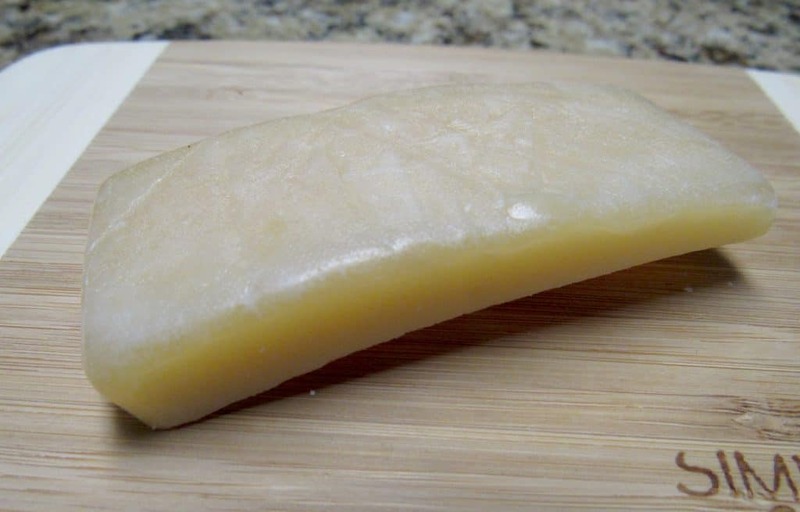 If you have never used your rinds before, always save them in the fridge or freezer! 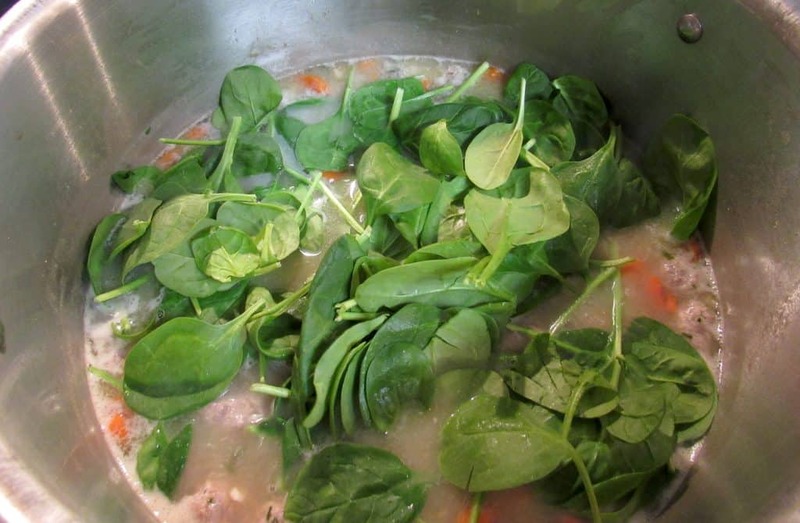 They are great to add to soups, they help thicken them as it slowly melts. Add the chicken stock to a large pot and bring to a simmer. 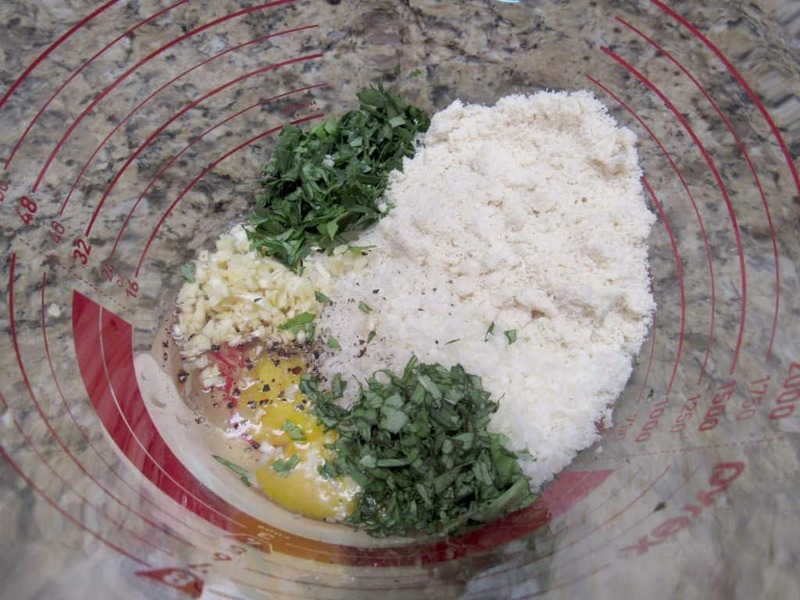 Add 1 egg, garlic, almond flour, basil, parsley, salt and pepper to a bowl and mix. Add in the ground beef and pork and mix just until combined, do not over mix. 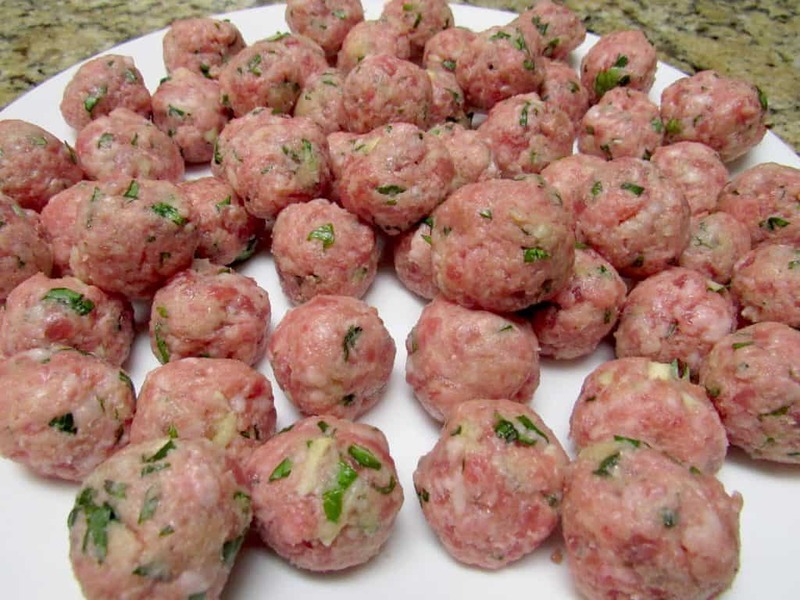 Using a small melon baller/scooper, form the mini meatballs, then drop them into the simmering stock. Add in the carrots and parmesan cheese rind (if you have one) simmer for 10 minutes. Add in the cauliflower rice and spinach, then continue cooking for another 5-7 minutes. Scramble the 2 remaining eggs and slowly add them into the soup, while stirring the soup. 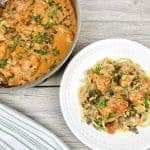 Cook for a few more minutes and allow to cool slightly before serving with some grated parmesan cheese and a garnish of parsley. 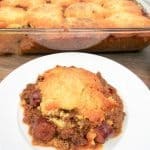 Note: The carrots are optional, so if you are on strict Keto, you can certainly omit them. 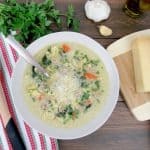 This is one of my all time favorite soups! If you've never had it before, you are in for a treat! It's incredibly easy to make and even the pickiest of eaters will love it! 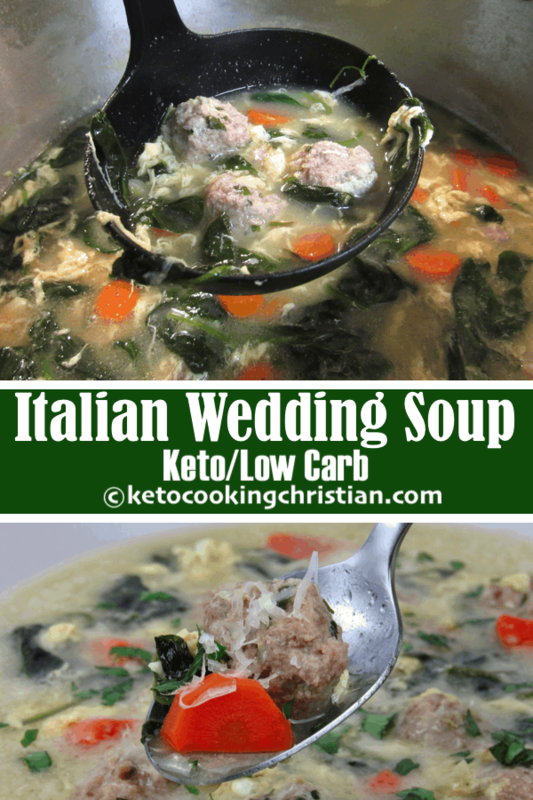 Italian Wedding Soup doesn't get it's name because it's served at Italian weddings,. It actually refers to how well the flavors marry together. 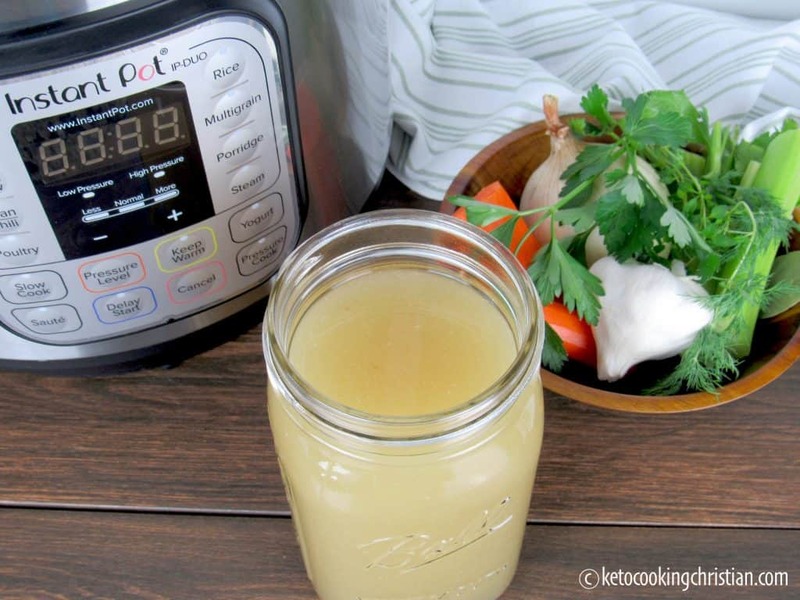 The base for the soups is chicken stock, which I love to make from scratch in my Instant Pot. It only takes 1 hour pressure cooked, but tastes like it's been simmering for 4-5 hours! 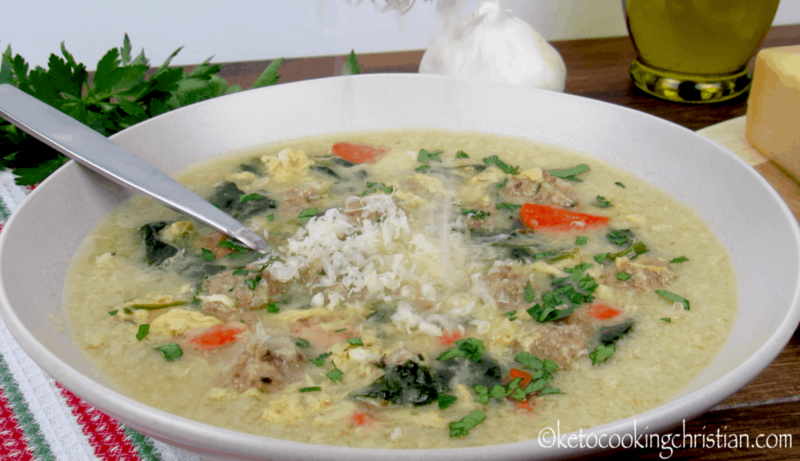 I add mini meatballs, cauliflower rice, parmesan cheese, fresh spinach and a swirl of eggs, similar to making egg drop soup! This soup is so hearty and is perfect to warm you up on cold days! Add 1 egg, garlic, almond flour, basil, parsley, salt and pepper to a bowl and mix. Add in the ground beef and pork and mix just until combined, do not over mix. 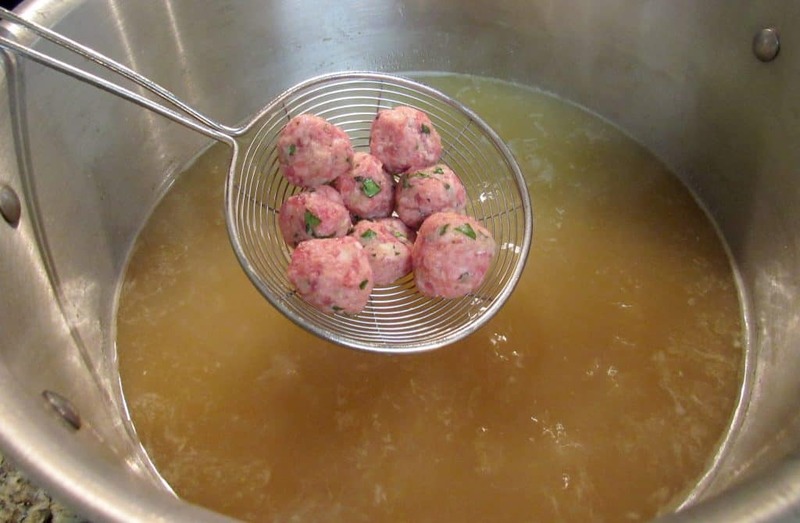 Using a small melon baller/scooper, form the mini meatballs, then drop them into the simmering stock. 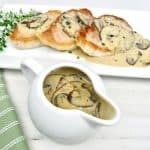 The carrots are optional, so if you are on strict Keto, you can certainly omit them. You are wonderful!!! Wonderful gift the Lord gave me today finding your recipe & love for Him!!! Oh how sweet of you, thanks so much for your kind words! 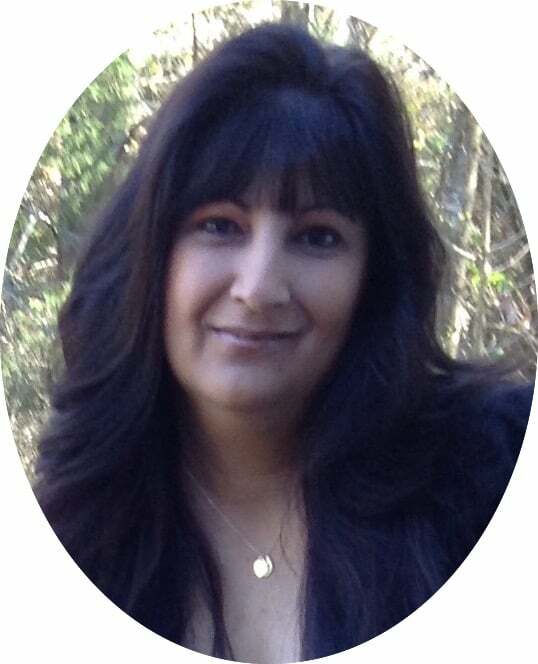 Lord bless and keep you sister!